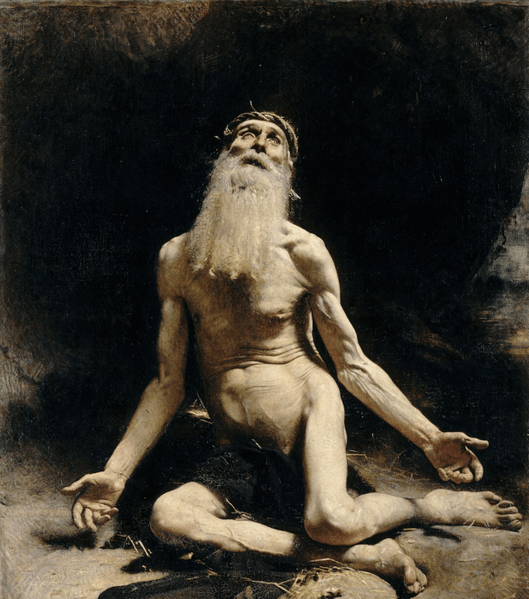 Leon Bonnat’s classic depiction of Job – the name means ‘Where is the heavenly Father?’ –crying out to God in his severe and unfair affliction. Job is the epitome of all that is unfair, unjust – and of Satanic origin. Job 1:1, 2:1-10 — God is over the tests of life which come to all. Satan is allowed to oppress righteous Job to try to get him to blame God. Mark 10:2-16 — God’s justice and good is for everyone equally. Man’s sense of hierarchy, status and privilege is confronted by Jesus’ teaching on marriage and children. Hebrews 1:1-4, 2:5-12 — Jesus redeems mankind by entering our messy world. He provided purification from sins by identifying with sinful mankind, so that He could be enthroned at the place of majesty in heaven. C of E only: alternative OT reading Genesis 2:18-24. At Creation, God creates woman out of man. 1 In the land of Uz there lived a man whose name was Job. This man was blameless and upright; he feared God and shunned evil. “Job… was blameless and upright” – his name is a Greek/English way of saying the Hebrew ‘iyyob meaning ‘Where is the heavenly Father?’ This sets the scene for the testing of Job in the story. He is depicted as having a consistent spiritual life (but not sinless), faithful before God and of spotless character – in contrast to the assumptions of his three friends. This is the tension explored in the whole book. 2:1 On another day the angels came to present themselves before the Lord, and Satan also came with them to present himself before Him. “On another day” – a second glimpse of angels of the heavenly court with Satan elbowing in, an unwelcome presence. The scene of Job’s second test is like the first, Job 1:6-12. In the first test Satan was bound from harming Job’s person and in this second Job’s person is vulnerable but his actual life is protected, verse 6 below. “You incited me” – God cannot be stirred up to act against His will. “Have you considered my servant Job” is an indication that God allowed what happened to Job as part of His purpose. God doesn’t send afflictions but may allow difficulties which test our trust of Him, hence “Lead us not into temptation” linked to “the evil one” in Jesus’ model prayer for disciples, Matt. 6:13. “Without any reason” – translates the same Hebrew word used for Satan insinuating that Job did not serve God “for nothing”, Job 1:9. The Lord throws “for nothing” back at the Accuser. “Skin for skin” – as we would say, quid pro quo. Job maintained his integrity in a test that cost him his skin and the “skin” of his animals. Satan, always the accuser, alleges that Job is only concerned for himself. 7-8 So Satan went out from the presence of the Lord and afflicted Job with painful sores from the soles of his feet to the crown of his head. Then Job took a piece of broken pottery and scraped himself with it as he sat among the ashes. “Painful sores” – the terms used for the ‘plague of boils’ in Egypt, Exodus 9:9-11. Also used for ‘painful boils’, Deuteronomy 28:35, which was set out as a specific covenant curse for the disobedient. This would all the evidence Job’s friends needed to tell him that he was being punished for sinning – a severe test of faith. “Are you still…” – Job’s wife sarcastically echoes God’s words in Job’s hardest trial so far, and uses a figure of speech to narrowly escape blasphemy. She mistakes Job’s dogged faith for religious obstinacy. “Shall we accept good… and not trouble” – Job’s controlled retort cancels his wife’s dangerous near-agreement with Satan and makes the central point of the Book of Job, that spiritual maturity recognises that God is sovereign over our lives whether in good times or adversity, and is able to trust Him while not understanding why bad things happen. IN PRACTICE Job’s miserable experience meets us where we are, in struggling to understand why bad things happen to good people. Job is presented to us as man of integrity, who honoured God and took trouble to avoid evil. So why is he singled out for affliction? Those who mistakenly (or even subconsciously believe) that God is a fickle creator can stop and reflect right here. We can see that some who are not deserving prosper, while people we know who are unselfish and upright before God face trials, in way which defies all human reason. Job and his friends struggled with this! The lesson is that we have an enemy, perhaps particularly targeting those who have a close walk with God. However, God’s purposes are higher, using affliction to test, prove and grow our faith and demonstrate that ultimately He has sovereignty over our lives and circumstances. QUESTION How would you explain this lesson to a struggling or health-challenged friend, bring out the need for faith and trust in God in the face of human logic? “Tested Him by asking” – test sometimes translated ‘tempt’, meaning ‘try to catch out’. John the Baptist had been beheaded for teaching that Herod Antipas’ divorce and remarriage was unlawful. With Jesus in Herod’s territory, the Pharisees thought they could indict him before the ruler for agreeing with John the Baptist. “A man to divorce his wife” – the only possibility under Jewish law, however in Jesus’ time there was much discussion about how to interpret the grounds which allowed divorce. Many Pharisees were advocating that men could initiate a kind of ‘no fault‘ divorce. “Moses command… Moses permitted” – the Pharisees came back with Deut. 24:1-4 which was not a command but an acknowledgement that marriages fail; it gave some protection for the woman’s rights. Like many of their interpretations of the Law, this had become conveniently twisted over time; divorce permitted in Deut. 24:1 for ‘something indecent’ had been changed from ‘something’ to ‘anything’. 5 “It was because your hearts were hard that Moses wrote you this law,” Jesus replied. “The disciples asked Jesus about this” – they were taken aback by Jesus’ reinterpretation of the Law. As He said elsewhere, He expected a higher moral righteousness than merely keeping within Israel’s civil law, Matthew 5:20. 13-16 People were bringing little children to Jesus for Him to place His hands on them, but the disciples rebuked them. When Jesus saw this, He was indignant. He said to them, “Let the little children come to Me, and do not hinder them, for the kingdom of God belongs to such as these. Truly I tell you, anyone who will not receive the kingdom of God like a little child will never enter it.” And He took the children in His arms, placed His hands on them and blessed them. “He was indignant” – a strong word, He was angry. People, probably parents, were bringing children for a blessing (the practice of laying on hands to bless was ancient). Challenging the pecking-order mentality of Judaism, in which children were not honoured and largely excluded, Jesus makes the point that the kingdom of God (or kingdom of heaven) must be received, and cannot be earned by merit. A child comes and simply receives a gift without asserting rights – in the same way, people must receive God’s kingdom as a gift, by coming to Jesus and receiving Him. See Matt. 5:3. IN PRACTICE Like the Jews of Jesus’ time, we want to make our own rules about marriage and divorce to accommodate shifts in culture, although this is strongly resisted in some parts of the world e.g. Africa. He entered a world that was male-dominated with a strong sense of privilege and rank and ‘small people’, typified by the small people who were children, being dismissed as of little account. His intervention, today as then, is to call us back to God’s creation intention. The kingdom of heaven’s order is about heaven’s equal-handed fairness without privilege or discrimination. QUESTION What is our sense of entitlement to Jesus’ kingdom order, and how might He tease out if we have really received it? The divine prophet, priest and very radiance of God became human, and endured man’s sin and oppression to sit at the right hand of God. 1-2 In the past God spoke to our ancestors through the prophets at many times and in various ways, but in these last days He has spoken to us by His Son, whom He appointed heir of all things, and through whom also He made the universe. 3-4 The Son is the radiance of God’s glory and the exact representation of His being, sustaining all things by His powerful word. After He had provided purification for sins, He sat down at the right hand of the Majesty in heaven. So He became as much superior to the angels as the name He has inherited is superior to theirs. “In the past, God spoke” – through the many instances and styles of His prophets, and then by the One who was a new category of revelation, not just a prophetic voice but His Son. “By His Son who…” – seven praise definitions follow: (1) heir of creation; (2) creator or co-creator of the universe; (3) the radiance of God’s glory; (4) the exact expression of God’s nature; (5) the Word of God Himself, the only prophet who is also God; (6) the priest of God, who purifies from sin; (7) the majestic king enthroned at the right hand of the Father. “Superior to the angels” – first-century Jews were fascinated by angels and held them in high esteem as those who minister before the throne of God and who revealed the Mosaic law at Sinai, Hebrews 2:2. Synagogue-tradition Jews were inclined to denigrate Jesus divine status and view Him as a mere angel. Jesus, whose name and therefore essence is Son, is not to be equated even with angels. “What is mankind that you are mindful of them, a son of man that you care for him? 8b-9 In putting everything under them, God left nothing that is not subject to them. Yet at present we do not see everything subject to them. But we do see Jesus, who was made lower than the angels for a little while, now crowned with glory and honour because He suffered death, so that by the grace of God He might taste death for everyone. “Someone has testified” – the author shows how Psalm 8:4-6 is fulfilled in Jesus. Jesus needed to become incarnate as man – and for that time, lower than the angels – so that the “son of man”, the Messiah, could be the truest representative of mankind, Daniel 7:13. The role intended for mankind at creation came to fulfillment in Jesus Christ sharing our humanity. 10-11 In bringing many sons and daughters to glory, it was fitting that God, for whom and through whom everything exists, should make the pioneer of their salvation perfect through what He suffered. Both the One who makes people holy and those who are made holy are of the same family. So Jesus is not ashamed to call them brothers and sisters. “Perfect through what He suffered” – not questioning Jesus’ sinlessness, but showing Jesus to have been qualified for His unique role “through what He suffered”, obeying perfectly, dying as the perfect sacrifice for sins on our behalf. The Amplified Bible adds to “perfect” “should bring to maturity the human experience necessary to be perfectly equipped for His office as High Priest”. “I will declare Your name… in the assembly…” – from Psalm 22:22, showing that Jesus Christ is present in the gathered church. IN PRACTICE Who is Jesus? The introduction to the letter written to Jewish Christians in particular, starts with a well-crafted single sentence that sets out Jesus’ identity as the prophet, priest and king who is also God. Yet He was also incarnated as a regular man whose unique role as redeemer of mankind was completed in His suffering and death. That puts Him in a logic-defying situation of being identified with and experiencing with us every abuse and injustice that part of this world’s package, and also being sovereign Lord – the Lord of heaven’s better, higher, more just way – over every aspect of our lives. He transforms us as part of His redeeming purpose, reminding us that in Him we have a family relationship – those being made holy are closely related to the One who is holy. QUESTION The definitions of who Jesus is are arresting, and to be called His brother or sister is almost beyond our grasp – but how does this help us in life? PRAYER Lord Jesus, help me to have a deeper revelation of who You are, and who I am through the transformation and new nature I gain in You. Help me, therefore, to live above my humanness and be a force for Your truth, justice and absence of discrimination. Amen.